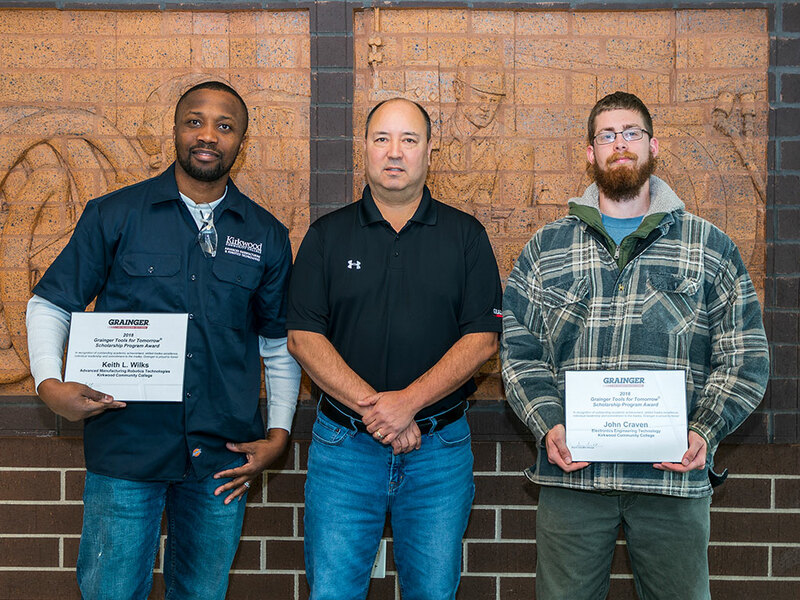 CEDAR RAPIDS, Iowa (November 13, 2018)-Two Kirkwood Community College students have been awarded scholarships by Grainger, the leading broad line supplier of maintenance, repair and operating (MRO) products serving businesses and institutions. John Craven and Keith Wilks will each receive a $2,000 scholarship as part of Grainger’s Tools for Tomorrow® program. Each year, Grainger offers two scholarships of $2,000 each at participating community colleges in the U.S. The scholarships offer financial assistance for tuition and books to students working toward an associate’s degree or certificate in skilled trade, supply chain management and public safety programs. In addition to the scholarship, Grainger provides tools to students after they graduate to help them launch a successful career. For 2018, Craven and Wilks are two of 250 scholarship recipients from 125 community colleges participating in Grainger’s Tools for Tomorrow program. Since 2006, Grainger has donated more than $4.5 million to support technical education. Half of the scholarships offered are earmarked for veterans of the U.S. Armed Forces.